Awana Genting Highlands Golf & Country Resort is a mere 45 minutes drive away from Kuala Lumpur, and is approximately 3,000 feet above sea level. Renowned for its abundant green surroundings and crisp, cool air, Awana Genting Highlands Golf & Country Resort is certainly a refreshing getaway from the hustle and bustle of the city. 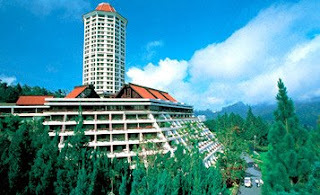 Outside the resort, visitors can opt for the five-star Awana Genting Highlands Golf & Country Resort which has 524 well-appointed rooms and condotels, an award-winning 18-hole championship golf course and a host of sports and recreational facilities. The natural surroundings of the hotel make it a popular place for eco-related sports activities and endless adventures. Awana Genting Highlands is also ideal for conventions with 17 well-equipped function rooms.